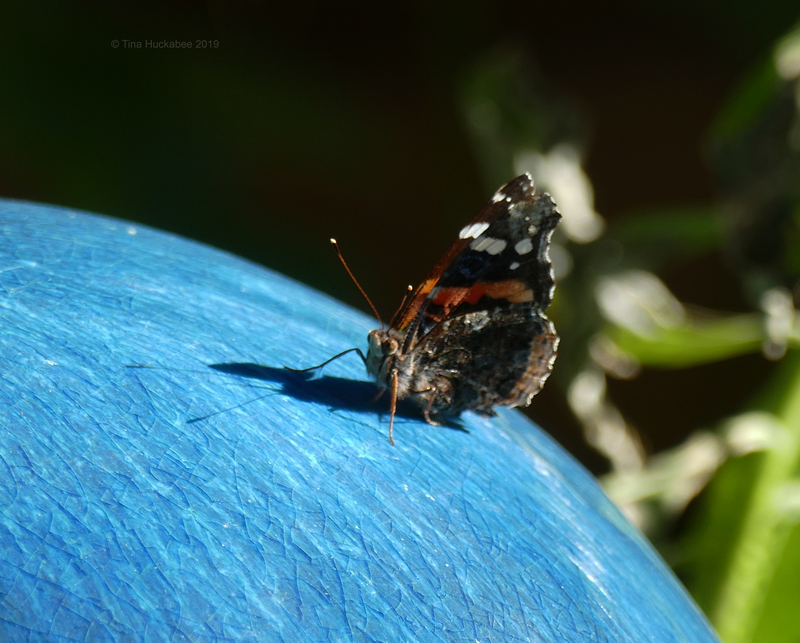 This entry was posted in Biodiversity, Red Admiral butterfly, Uncategorized, Vanessa atalanta and tagged Earthrise photo, Wildlife Wednesday by Tina. Bookmark the permalink. Beautiful thoughts for the new year. 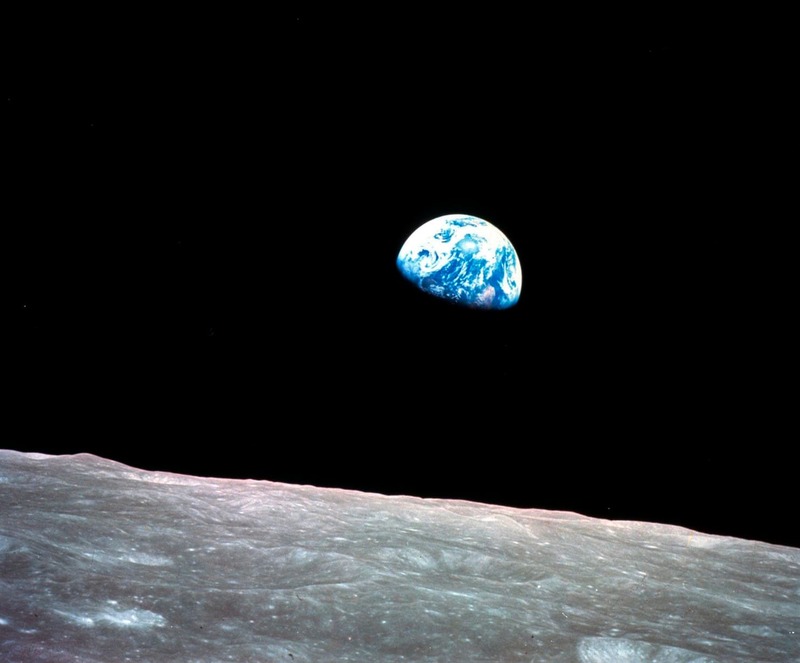 I still remember seeing that earthrise photo for the first time on a fuzzy b&w screen. Red Admirals in my yard nectar on the non-natives like pittosporum which does not bloom every year but when it does I find blooms covered with Red Admiral butterflies for days. Tina, have you ever read Stephen Harrod Buhner….I am sure that you would love his books! I haven’t, but I’ll look him up! Thanks! What a wonderful and inspiring post. 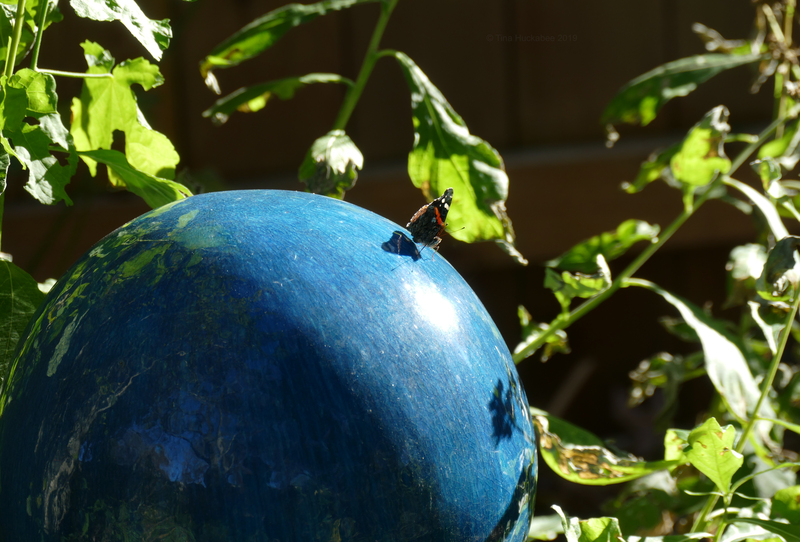 I love the connection you created with the ceramic globe, earth rise, and the intricate web one discovers when creating a garden. Thank you for sharing your experiences and knowledge. May 2019 be full of wonders for you! Thank you, Maggie and the same to you for 2019! We are of like minds. I started “gardening” with houseplants while in college. I had one of those butterflies in my yard and it landed on a guest’s head. I said I would look up the name and now I don’t have to. I’m also a bit of a space geek and watch every documentary and sci-fi I can. Watching Star Trek as I type…and birds from my window. Haha–I need to watch Star Trek again! Those red admirals are gregarious butterflies; they’ve landed on me, too, though not on my head. At least, not that I’m aware of. Beautiful musings to ring in the new year, Tina! That classic shot of our planet drove home the fragility of our situation. In my opinion, it is still the perfect inspiration to keep driving environmental issues hard. Here is to a better year ahead for our planet and our co-inhabitants! Yes! It’s such a beautiful photo and it remains an important icon. Let’s do hope for the better year–and years to come. 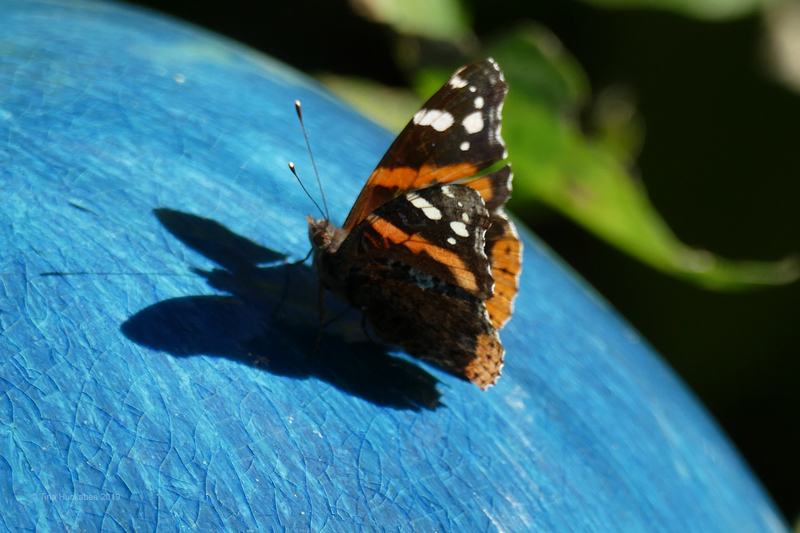 I made that same beautiful, hopeful connection seeing that butterfly on the blue globe. What a perfect image. We are living in an extinction emergency yet life keeps trying when given even a tiny foothold. I missed out on this Wildlife Wednesday but I’d like to participate in the next. Here’s a Wildlife Wednesday-like article we recently published: http://animamonday.wordpress.com/2018/12/24/mistletoe-on-christmas-eve/ Next time I’ll make sure to link back. Thanks for organizing this. It is a terribly important thing to appreciate the life around us. Thanks! People know about global climate change, but not that the extinction of insects and birds is a serious threat. But you’re right, wild life works hard–may it continue. Hello Julie! So nice to hear from you–I hope you’ll be back to your beautiful blog soon. Thanks so much for reading. Thank you, Gillian and it’s good to hear from you! So glad you could join in! What a wonderful a vignette of the big picture! 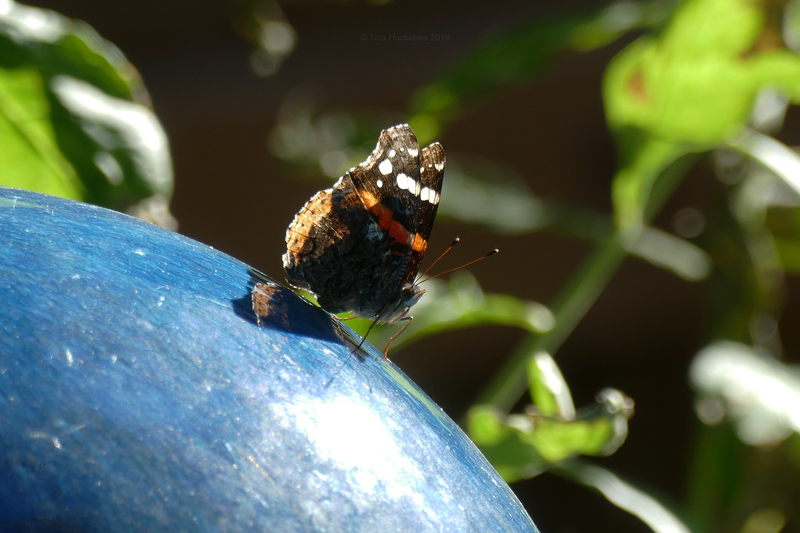 Red admirals love the stone fruit when it falls in our garden and the buddleia of course, plus we certainly grow enough nettles to keep the cycle going. What especially beautiful writing. I too find that gardening for wildlife is the most rewarding and enjoyable way to go about things. Thank you for telling the Apollo story – I can just imagine them with all that film excitedly trying to take a photo! What a treasure we have. Thank you, Ms. Kitty! It is rewarding, this business of planting and observing those who require the plants. If you click on the link for the PBS documentary ‘Earthrise’, the astronauts themselves share their story–it’s fascinating! Thank you, Deb. Trust me when I say that I also feel like throwing my garden-gloved hands up, and often. But, I persist. 🙂 Musing in my garden, or taking a walk or a hike is rejuvenating, and so, I continue. Thank you, Val. That’s interesting and they certainly are admirable! I spent a good bit of time the past few days watching the news conferences and reports from New Horizons’ visit to Ultima Thule. I think it’s important not only for the scientific information that will be gleaned, but also because it encourages us to again look outward, beyond ourselves, to what’s yet to be discovered. Perhaps as it did for the astronauts, that kind of looking outward will turn our gaze earthward again, and renew a sense of commitment to this place we call home. I’m so looking forward to the coming year, and to watching all of your gardens shake off their fallow time to begin blooming again. While I’m not in a position to garden myself, I can encourage others, and perhaps find a garden to help with this year. Last year’s native plant society project — a new garden in a new civic park — seems to have fizzled, but I’ll keep looking around. I agree with you and I hope that we will recognize (and some certainly have) that for the foreseeable future, Earth is our home and we must take care of her. You may not have a garden to tend, but you provide such value with your stunning photos, gorgeous prose, and your enthusiasm for our beautiful flora and fauna. Let’s move forward into 2019 celebrating our part of the Earth and helping it heal in any way we are able. Nice pics. We see Red Admirals every year, though in varying numbers. I hope your garden is rich in wildlife in 2019! Thanks, Jason. I look forward to seeing your spring, summer and autumn garden. Always happy to read your about your wildlife-friendly gardening philosophy. Much of my large yard is left-alone native plants, but I’d like to have more pollen sources. I’m considering planting more wildflowers this spring (xerophytic natives), maybe even convert the pea patch! Thanks, Hollis. Are there wildflowers common during your summer and autumn months that are available in either small pots or by seed? It seems like your climate is friendly to having wildflowers during the course of the growing season. I’d love to read some posts about wildflowers on your blog. I enjoyed your post, and particularly the Cosmic view you have taken. At first, I thought conservation was defined by not shooting things out-of-season. Before long, I found that conservation was year-round and global. Animals of all kinds requiring respect and care. The third iteration of my conservation philosophy was to include landscape environment and plants. Elimination of invasives and promotion of natives. Now, my mature conservation ethic leads me to treat all things with this same reverence, with a desire to embrace and protect all the natural elements of our blue ball, including the non-living. This includes the soil itself, the fertile oceans, the streaming clear rivers, the calving glaciers. Earth is my mother, and all of her pains are my pains, her losses my losses. I shall cling and cleave unto her, and defend her with my life, to my last day. May peace and nature fill your days and nights. Thank you, Paz. I think an overall–Cosmic, if you will–is really the only way we should see interactions on our home. All the rest is commentary. I can certainly understand hesitancy during a drought, it’s no fun to become a slave to a garden. Wishing you snow and rain and many good posts!